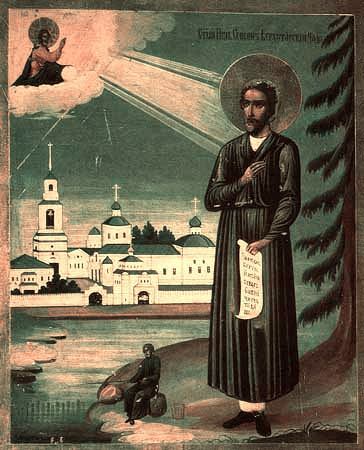 Righteous Simeon of Verkhotursk (+ 1642) was a nobleman, but he concealed his origin and led the life of a beggar. He walked through the villages and for free sewed half-coat and other over-clothes, primarily for the poor. While doing this he deliberately failed to sew something – either a glove, or a scarf, for which he endured abuse from his customers. The ascetic wandered much, but most often he lived at a churchyard of the village of Merkushinsk not far from the city of Verkhotur' (Perm outskirts). Saint Simeon loved nature in the Urals, and joyfully contemplating its majestic beauty, he would raise up a thoughtful glance towards the Creator of the world. In such of his time as was free of toil, the saint loved to go afishing in the tranquility of solitude, since this reminded him of the disciples of Christ, whose work he continued, guiding the local people in the true faith. His conversations were that seed of grace, from which gradually grew the abundant fruits of the Spirit in the Urals and in Siberia, where the saint is especially reverenced. Righteous Simeon of Verkhotursk died in 1642, when he was but 35 years of age. He was buried in the Merkushinsk graveyard by the church of the Archangel Michael. On 12 September 1704, with the blessing of the Tobol'sk metropolitan Philothei, the holy relics of Righteous Simeon were transferred from the church of the Archistrategos Michael to the Verkhotursk monastery in the name of Saint Nicholas. Righteous Simeon worked many a miracle after his death. He frequently appeared in a dream to the sick and healed them, and he brought to their senses those fallen into the disease of drunkenness. A peculiarity in the appearance of the saint was that with the healing of bodily infirmities he gave instruction and guidance for the soul. The memory of Righteous Simeon of Verkhotursk is celebrated also on 12 September.